John Benjamin (Ben) Morton served in the United States Marine Corps and participated in three deployments to various parts of the world. Juan Chavez, has experience in the maintenance and compliance with government contracting. Ms. Colleen Czaplicki oversees all of the financial aspects of the company to include invoicing and payroll. Rene has a keen understanding of the Private Security Industry in large part to her experience as a Security Licensing Investigator. John Schrab served in the United States Marine Corps in various combat, humanitarian, and security operations around the world. Shelby Thompson has over 5 years of experience in security related fields, and is a highly dedicated individual to serving our customers in any way possible. John C. Morton is a Retired Combat Arms Career Marine Officer with 23 years of service. Six of those years were served protecting our Nation’s our nuclear arsenal. It was in his position as Guard Officer, and later Commanding Officer of a Marine Corp’s Security Company, that John gained a comprehensive knowledge of Security Tactics, Techniques, Technology, Procedures, and Site Security Development. John then worked with the FBI’s Counter-Terrorism Office as a Force Protection and Anti-Terrorism Officer for a large Military Base. It was here that John gained a knowledge and the skill set of large scale civic event security planning, protocols, & coordination. 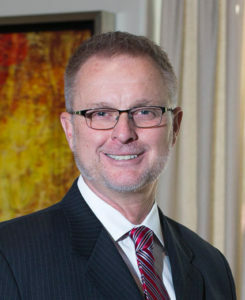 John is thePresident/CEO of Four Peaks Security, an elite security firm serving clients with High-Value Assets. John resides in Scottsdale, AZ with his wife, 3 children, and 4 grandchildren. John Benjamin(Ben) Morton- served in the United States Marine Corps with 1st Battalion 9th Marines from 2009-2013 as an Infantry Mortarman(0341). During which time, he participated in three deployments to various parts of the world, including Afghanistan, Cuba, Haiti, Jordan, and Kuwait. Shortly after the service, Ben began his pursuit for a degree in Political Science, which he completed at the end of 2017. 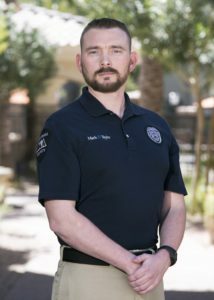 He is currently the Operations Chief of Four Peaks Security. 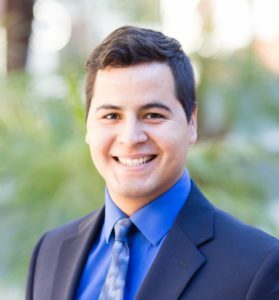 Juan Chavez, has experience in the maintenance and compliance with government contracting. He currently manages and ensures compliance for 15 different contracts for our company, and remains the “Go-To Guy” for our company. Ms. Colleen Czaplicki oversees all of the financial aspects of the company to include invoicing and payroll. She has over 30 years’ experience in office administration, bookkeeping and banking. With her diversity and experience Colleen brings to the team a sharp mind for detail as well as excellent people skills. Ms. Rene Audsley has amassed over 25 years of Public Safety/Law Enforcement experience. 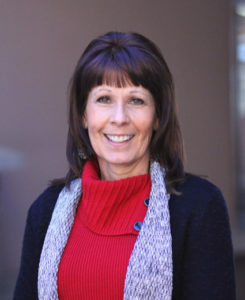 During those years, Rene worked in various positions with the Arizona Department of Public Safety. Such positions include; Motorcycle Patrol Officer, Asset Forfeiture Officer, Organized Crime Investigator, Dignitary Protection for the Office of Governor, Narcotics Investigator, and Executive Protection Agent. Rene has a keen understanding of the Private Security Industry in large part to her experience as a Security Licensing Investigator. 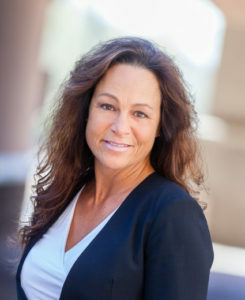 Rene’s knowledge is unparalleled and has flawlessly transitioned from Law Enforcement to Private Security where she has spent the last three years protecting VIP’s, Professional Athletes, Sports Franchise Owners, and Professional Coaches. Rene is an Arizona Department of Public Safety Certified Armed Security Trainer. 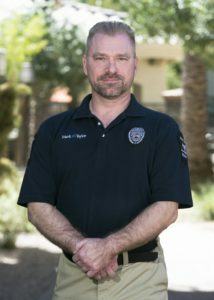 Roland Silaraups is currently a site supervisor with Four Peaks Security where he is responsible for security procedures of a high-end property. Roland has over 25 years’ experience in various areas of the security field. Ranging from Advanced Executive Protection, where he’s protected high-net worth International clients to instructing hand to hand combat to the members of the U.S. Military (Marine Force Reconnaissance and US Navy SEALS, law enforcement personnel on the local and federal levels. My name is Yoraidyl Celiné Covey. I lived in South Dakota until I made the venture to Scottsdale, Arizona end of 2015. I have been a member of the Army National Guard for 14 Years. I have deployed to Afghanistan for Operation Enduring Freedom in 2014. My previous security background was in Corrections for the State of South Dakota for seven years. It is my passion to serve and protect others in any way that I can, and my dream to positively impact others. I’m thankful for four peaks and the opportunities and growth it has provided me. John Schrab served in the United States Marine Corps from 2007-2016 as an Infantry Rifleman (0311). During which time he participated in various combat, humanitarian, and security operations around the world with 1st Battalion 9th Marines. After leaving 1/9, John was sent to the drill field as a Drill Instructor at MCRD San Diego, where he served in the training of Marines until late 2015. 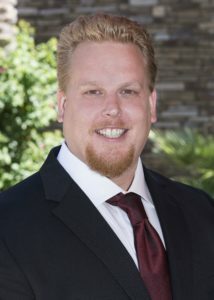 John currently is a site supervisor for Four Peaks Security at a high-end residential property. He is highly dedicated individual that places the safety and security of other above himself. 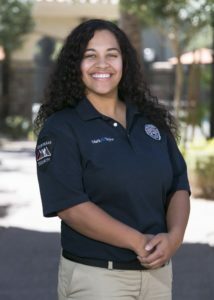 Shelby Thompson is currently a site supervisor with Four Peaks Security where she is responsible for security and hospitality services at a high-end property. 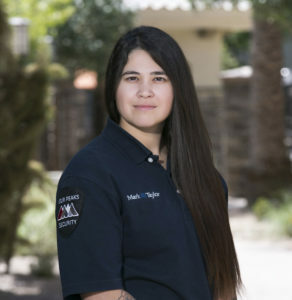 She has over 5 years of experience in security related fields, and is a highly dedicated individual to serving our customers in any way possible.